Bristol Jazz and Blues Festival filling Colston hall and beyond with Jazz, blues, dancing and people having fun enjoying live music. This year due to snow and other constraints Bluesdoodles crossed the bridge into England only once to visit the festival. Friday was a night not to be missed for a lover of electric blues guitar as Matt Schofield Trio were back in town for one night only playing the blues that filled the Lantern with pure pleasure. We deliberately arrived early. The music in the foyer entertains and the buzz of the festival adds to the pre-gig excitement. We were not disappointed. Zoe Schwarz Blue Commotion entertained in the foyer on arrival. The show was early but already the hall was teeming with people and the dancers were warming up their dancing shoes. As ever Zoe and her band delivered classy blues that eased the stresses of the week, putting us in the mood for fun. Showcasing songs from their latest album, The Blues And I Should Have A Party including Chislehurst Caves. Zoe’s vocals power through the songs that are melodic and bluesy. Her band Blue Commotion are inspiring, perfectly formed and executed guitar lead breaks, the intricacies of the Hammond and the bass lines combining with drumming that pulls the sound together. They delivered a harmonious set that pleased the foyer crowd immensely. Following on from this with the seats pushed back forming a dance floor for a short but exciting dance routine from the Bristolettes. Then a jazzy set of Paper Moon as they took over the foyer stage. Fronted by the second female vocalist of the evening Lucy Moon. This is a quintet that is full of swing and the dancing continued with rhythms that no one can ignore as I overheard ” A lovely way to chill on a Friday night”, so true the Foyer music and atmosphere was the perfect start to an end-of-week evening out. Now for the main event for Bluesdoodles tonight, a rare opportunity to hear the wonderful guitar tones and playing of Matt Schofield. Now he has moved to the States his visits are far too few and far between. The trio re-formed with Jonny Henderson’s Hammond magic, and Evan Jenkins’ wizardry on the drums added to the blues sorcery that Matt Schofield’s guitar produces on every outing. This is blues that shimmers and sparkles igniting your blues DNA with pure unadulterated joy. The opening number was perfect the opening track from his album Heads, Tails and Aces – What I Wanna Know. The trio played as if they had never parted it was music to my ears. The music flowed with the trio having fun, the audience was having even more! We were totally immersed in blues that was a sparkling dancing mix of licks, riffs and rhythms this is blues that is pure and clean as a summer sky. The solos from Evan and Jonny were delightful. Above all the jamming between the three maestros was an ecstatic listening experience. The set was replete with tracks from Siftin’ Through Ashes. The music was top-notch. 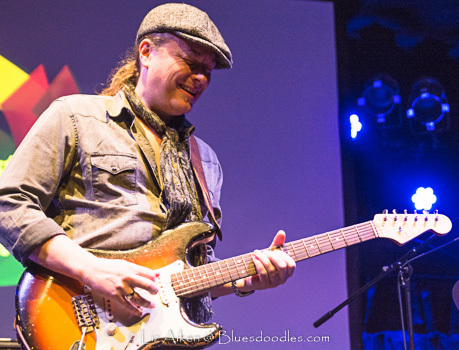 The tones that Matt cajoles out of his custom Strat-styled guitar is sensational. This is top notch blues from a master craftsman. The trio cast their spell over us we wanted more, alas a short encore, Troublemaker closed out a night of blues that was simply electrifying. The message from everyone in the audience was sincere and clear, come back soon Matt, a new album would be welcomed too.